Please mark your calendars for the CACUSS Annual General Meeting: Tuesday June 4, 2019 at 12:00 ET. New format for 2019! In order to allow all members to participate we will be holding our AGM online. Join or Renew between March 11-13 and you'll be entered into a prize draw to win one of five fabulous prizes! Registration is now open for the CACUSS 2019 Conference! CACUSS is pleased to offer a variety of Publications and Webinar recording for sale on our new E-Store! CACUSS is hiring a contract position to assist us with moving our research agenda to the next stage! Le comité du programme du congrès et notre hôte, Université Mount Royal, vous encouragent à soumettre une proposition en vue du congrès MOH-KINS-TSIS, qui se tiendra du 16 au 19 juin 2019 à Calgary. CACUSS is now providing increased communication and exposure for jobs posted on the CACUSS job board! Registration is now open for the 2018 Student Conduct Institute taking place Nov 13 - 16 at Humber College in Toronto. The NPI Bursary will support one deserving new professional to attend the NPI in Niagara Falls in November. The CACUSS Board of Directors recently approved our CACUSS Research Agenda (2018-2021). The new Issue of Communique 2018 is now available to view online! CACUSS is excited to announce the 2018 Canadian Assessment Institute Facilitator Team. Applications are now being accepted for the position of Co-Chair for the CACUSS Networks and Communities of Practice. CACUSS is excited to announce the first plenary session for the 2018 Canadian Assessment Institute. Want to learn and build your professional experience? Would you like to attend the annual conference, but you have limited PD funds available? First CACUSS conference? Presenting? 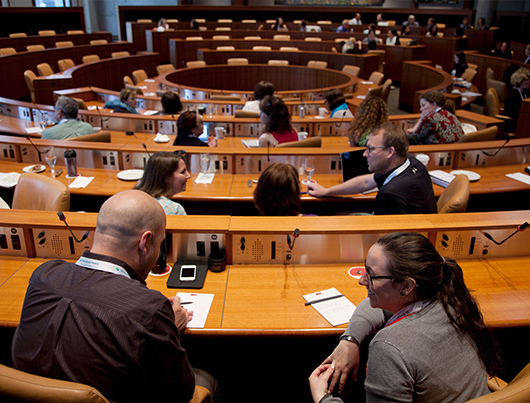 CACUSS has bursaries available to cover the registration fee for the annual conference (valued at approximately $600). In 2017 we were able to award 8 bursaries to the conference. The bursaries cover the cost of your registration fee (which includes all educational sessions, most lunches, breaks, receptions). Travel, accommodations, and other expenses are the responsibility of the individual or their institution. Applications are due by February 15, 2018 to awards@cacuss.ca. Click here for more information. CACUSS is pleased to announce several new professional development offerings for 2018! The deadline to ensure that your mailing address is correct in order to receive your copy of Communiqué has been extended to Dec 1st. Canadian campuses and stakeholders continue leading efforts to improve health and well-being of students, faculty, staff. CACUSS is excited to announce a new webinar series on Assessment that will consist of 6 webinars over 6 months from Nov 2017 to March 2018. CACUSS is excited to announce that we have launched our new CACUSS Community Engagement Platform to provide more interaction, engagement, resources, and value for our members! CACUSS is excited to announce the Faculty team for the first CACUSS New Professionals Institute, taking place November 5-9, 2017. We have posted the reports for the 2017 AGM including the Nominations Committee report for the 2017-18 Board of Directors. Votez aujourd'hui. Vous pourrez voter à compter du lundi 27 mars jusqu'au lundi 10 avril à 23 h 59 HP. Les membres recevront un courriel pour voter. The following CoPs and Networks are seeking members to fill the co-chair role for the upcoming 2017-18 year. Co-chairs engage and lead communities of practice and help support fellow members.